Until the 1930s, modern surfing in Hawaiʻi was focused at Waikīkī; there the waves were smaller. Then, in 1937, Wally Froiseth and John Kelly, reportedly on a school trip witnessed the large break at Mākaha and later surfed its waves. They were later joined by George Downing and others. Mākaha became the birthplace of big wave surfing. Even before Oʻahu’s North Shore, Mākaha was ‘the’ place for surfing – especially big-wave surfing. In January 1955, the first Mākaha International Surfing Championships was held and for the next decade was considered the unofficial world championships of surfing. While that contest faded away, in 1977, Buffalo Keaulana, a living legend of Mākaha (and Mākaha International champion in 1960,) started the Buffalo Big Board Surfing Classic (featuring canoe-surfing, tandem surfing, bullyboarding (oversize tandem bodyboards), bodysurfing and longboards) and it has been held every year since. Rell Sunn, the ‘Queen of Makaha,’ in 1976 began the Rell Sunn Menehune Surf Contest; children 12 and under compete in body board, long board and short board, and each event is broken into age and gender categories. In 1983, Sunn was diagnosed with cancer; she died in 1998. June 20, 2013, today, is International Surfing Day (held annually on or near the summer solstice.) Established in 2004, it is a worldwide celebration of the sport of surfing. 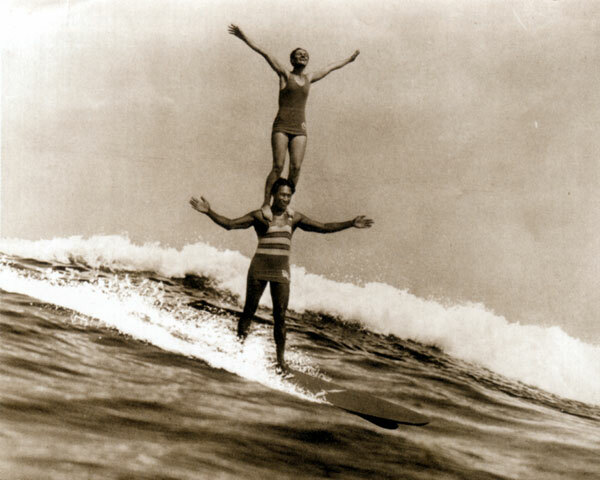 The image shows Duke Kahanamoku and partner tandem surfing . In addition, I have included other related images in a folder of like name in the Photos section on my Facebook and Google+ pages.